As previously reported, Tokyo Police Club will be releasing their second full-length, Champ on June 8 via Mom + Pop. However, it turns out that the New York-based Mom + Pop will only be handling the U.S. release of the album. In Canada, Champ will be issued via the band's own imprint Mean Beard and their new Canadian home of Dine Alone, the Toronto label that has previously handled releases by Alexisonfire, City and Colour, and Arkells. 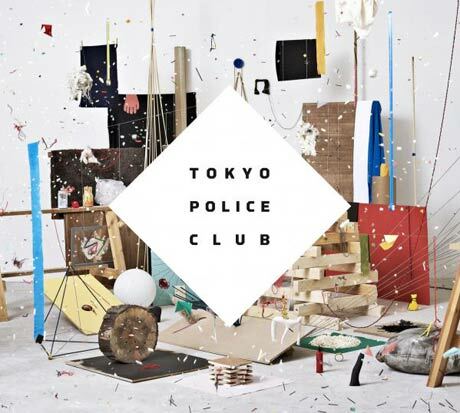 When Tokyo Police Club initially announced the album, front-man David Monks said, "It has 11 songs, a Disney character, fuzzy bits, Canadian spelling, hockey sound effects, me singing the lowest note in my range, one (1) saxophone note. and if all this makes you think that we're rereleasing a tribute to the score of Disney's The Mighty Ducks, then you may not be entirely off the mark." You can see evidence of at least three of those things in the tracklist, which you can check out below. Also be sure to take a look at the new cover art up there above, and head over to Tokyo Police Club's website to download the single "Breakneck Speed" in exchange for an email address. 4. "Boots of Danger (Wait Up)"
6. "End of a Spark"